Being an expectant parent comes with a lot of fears and concerns. Having something like a baby doppler for home use can help quell some of those worries, even if it’s not necessarily something you should use constantly. Being able to listen to your unborn baby’s heartbeat at home can ease some of that pre-birth anxiety. On the flipside, it can also cause a little concern inadvertently if you feel the heartbeat is too fast or too slow, so it’s really up to you to decide if you absolutely need one. 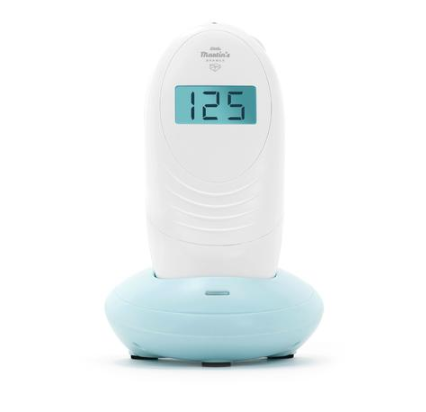 But for those days in between doctor visits when you’re worried that things are going OK with your baby’s growth in the womb, the home baby doppler can help you feel a little more comfortable. 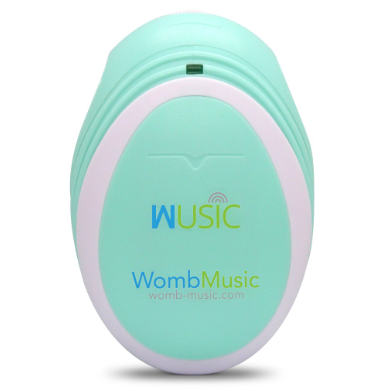 The Wusic Womb Heartbeat Baby Monitor is all about bonding with your baby before he or she is even born. It’s best when used after week 16 of your pregnancy and can be used to hear your baby’s heartbeat at any given time. You can use aloe vera gel or a chosen lubricant in order to have less static get in the way of hearing your unborn baby’s heartbeat and afterward, you can save and download the womb sounds to your computer to save and listen to later or share with friends and family. The monitor itself is small enough to fit in your pocket if needed and has two headphone jacks so you can listen to the heartbeat along with your partner at the same time. As your baby grows inside of the womb, his or her heartbeat will get stronger and stronger, although it’s recommended to only listen every few days rather than every day in succession. Where To Buy: You can primarily find it on the manufacturer’s website. The Best Part: You can download and save recordings of your baby’s heartbeat. The Not So Great: Unless you use a very liberal amount of gel, the sound might be a little hard to hear. Price: The Wusic Womb Heartbeat Baby Monitor is $57. Has This Item Been Recalled? There are no recent, or current recalls on the Wusic Womb Heartbeat Baby Monitor. You can use either connected headphones or the built-in speaker on the Up & Raise Fetal Doppler to hear your unborn baby’s heartbeat. It has an easy to read and easy to understand screen with your child’s heart rate to give you peace of mind throughout your pregnancy. It will also enable you to hear your baby’s heartbeat and bring you and your partner closer to your soon-to-be-born baby. It’s built with a less intensive soundwave but meant to still get the same kinds of consistent results as other similar home dopplers. It can also record your baby’s heartbeat so you can save it on your phone or computer and listen to it again later. The clear speaker also acts as a sort of home base to cradle the doppler when it’s not in use. The Best Part: The sound waves are so strong with this one that you might even be able to get a clear sound before 16 weeks. The Not So Great: Some phones may not work well in recording the sounds from the doppler. Price: On Amazon, the Up & Raise Fetal Doppler is $60. Has This Item Been Recalled? 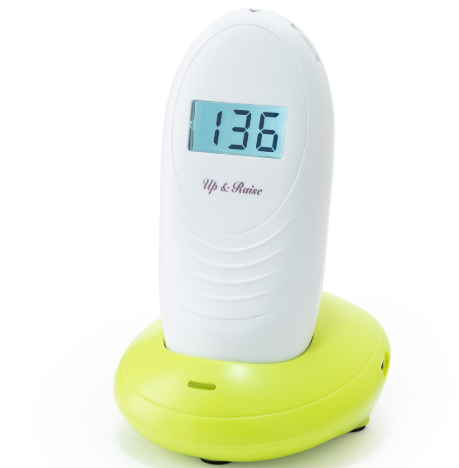 There are no recent, or current recalls on the Up & Raise Fetal Doppler. Summer Infant is home to plenty of other baby products, so the Summer Infant Heart-To-Heart Digital Prenatal Listening System should be just as trusted. Not only does the device allow you to hear your unborn baby’s heartbeat, but with it, you can also hear their little kicks and hiccups while they’re in the womb. It’s equipped with a positioning belt to wear it while you listen and there’s even a volume button to adjust the sound as needed to get the clearest reading possible. There are also two headphone jacks to enable you and your partner or other loved ones to listen to your baby at the same exact time. To get the best and clearest reading every time, however, it’s recommended that you use this doppler during the third trimester only. The Best Part: If used correctly and precisely, you really can hear all kinds of different baby sounds in the womb. The Not So Great: You only get top results if it’s used late in your pregnancy. Price: On Amazon, the Summer Infant Heart-To-Heart Digital Prenatal Listening System is $37. Has This Item Been Recalled? There are no recent, or current recalls on the Summer Infant Heart-To-Heart Digital Prenatal Listening System. Jumper is home to lots of different portable fetal dopplers, but as far as at home ones go, the Jumper Home Use Portable Sound Listener Unit System is a solid option. Unlike some other dopplers, you can potentially use it at the 12-week mark, and it even comes with a chart to let you know the bet positions on your abdomen to listen to your baby’s heartbeat at different weeks throughout your pregnancy. There’s an audio jack to plug in your own headphones or earbuds, but you can also use the built-in speaker. Use either the volume up and down buttons or the loudspeaker to really share the sounds of your womb with loved ones nearby. And because it’s so compact and easy to use, you can check in on your baby’s heartbeat at home, work, or even outside, regardless of any other noises in the area. Where To Buy: You can primarily find the doppler on Amazon at this time. The Best Part: It has a loudspeaker, unlike some other similar at home monitors, so others can hear your baby’s heartbeat if you want to share the sound. The Not So Great: The power button might sometimes click on while the doppler is in your purse or diaper bag. Price: On Amazon, the Jumper Home Use Portable Sound Listener Unit System [/easyazon_link is $65. Has This Item Been Recalled? There are no recent or current recalls on the Jumper Home Use Portable Sound Listener Unit System. 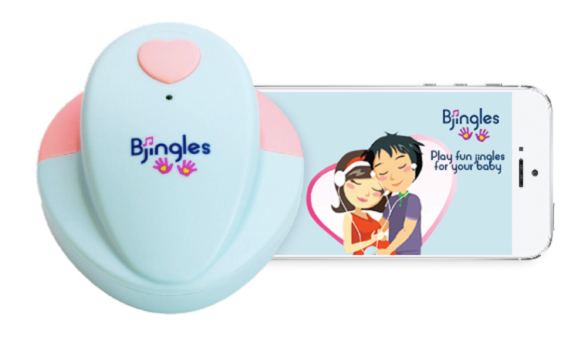 The Bjingles Baby Heartbeat Monitor allows you to listen to your unborn baby’ heartbeat of course, but it also provides plenty of use after your baby has already been born. Use it with the app, and you can record your baby’s heartbeat to save and even your own heartbeat to later use as a soothing sound for your newborn. Speaking of which, the app also has white noises to calm your baby if needed, so the benefits really keep going. The monitor is also one of the easier and less involved ones to use. You just plug in two different headphones into the two jacks and use the dial on top to adjust the volume as needed. It doesn’t have an exterior speaker, but it does have a 9-volt battery to give you the ability to listen to your baby’s heartbeat anytime anywhere. Be advised that the monitor isn’t meant to take the place of actual doctor visits, but it can give you peace of mind throughout your pregnancy. The Best Part: You can later use recordings of your own heartbeat to soothe your newborn. The Not So Great: It may not give you the clearest sound as other similar at home fetal dopplers. Price: The Bjingles Heartbeat Baby Monitor is $70. Has This Item Been Recalled? 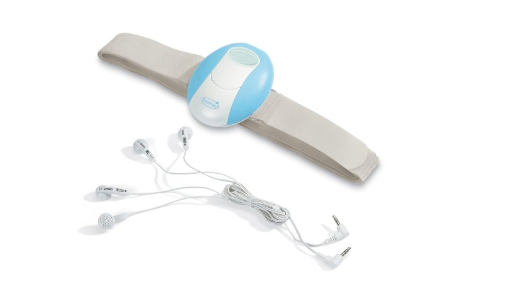 There are no recent or current recalls on the Bjingles Baby Heartbeat Monitor. The Little Martin’s Baby Sound Amplifier and Recorder was designed to pick up all kinds of heartbeat sounds with its extra sensitive detecting probe. You can use it with earbuds or the speaker and save heartbeat recordings to your phone to share with loved ones. It also has a large LCD screen to see your baby’s heartbeat every time clearly. Whether you use the speaker or one or both of the headphone jacks, you can adjust the volume as needed to really get a clear sound of your baby in the womb. Overall, the doppler is not only easy to use, but it’s also easy to take along with you anywhere you go to listen to your baby’s heartbeat on the fly if you want to. The Best Part: It’s easy to find the heartbeat almost every time without too much moving around. The Not So Great: It is on the more costly side. Price: The Little Martin’s Baby Sound Amplifier and Recorder is $72. Has This Item Been Recalled? There are no recent or current recalls on the Little Martin’s Baby Sound Amplifier and Recorder. The BinleFois Portable Sound Amplifier is designed in a classic way with a doppler wand connected to the sound amplifier. You just squeeze a liberal amount of gel on your abdomen to move the wand smoothly over and get a clear heartbeat from as early as 12 weeks. Of course, early on you’ll need to use the doppler lower on the abdomen, but you could still get a reading on your baby’s heartbeat that early. You can use a headset to listen to the heartbeat and bond with your little one before they’re even born and the display screen interface is easy to understand. It should work for at least eight hours before you need to charge it, so you can feel free to take it outside of your home as needed to hear your baby’s heartbeat anywhere. The Best Part: You get a long charge life to be able to take the amplifier away from home without worry about it dying before you can use it. The Not So Great: The cord on the doppler wand isn’t as long as that of other similar at home baby dopplers. Price: On Amazon, the BinleFois Portable Sound Amplifier is $65. Has This Item Been Recalled? There are no recent or current recalls on the BinleFois Portable Sound Amplifier. Having one of the best baby dopplers for home use in your own home can help you bond with family members and loved one over your unborn baby. If you can learn to properly use the doppler to find your little one’s heartbeat, it can be the difference between worry and excitement over your baby’s birth.